My Training Goals For 2018 - Welcome To Staley Strategies Online Fitness Coaching! Ah yes, the new year is nearly upon us, and most of us are thinking about the progress we have (or haven’t) made in 2017), and how we might be even better in 2018. While I tend to roll my eyes hard at the thought of New Year’s resolutions, if I’m being honest, I do find that just like everyone else, I view the coming year as an opportunity for renewal — as a chance to finally make the progress that I view myself as capable of. Another positive is that I haven’t experiences even a single significant injury this year, nor have I had any general health issues crop up. I’ll take that as a win. On the negative side of the ledger, my training, especially during the latter half of this year, as been inconsistent at best. This is largely due to stress stemming from other areas of my life. With those observations in hand, my primary objective for 2018 is to straighten out those non-training related ears of my life that are negatively impacting my workouts (and recovery from those workouts). Which leads to the first potential lesson for you: make sure your life is supporting your training efforts as well as possible. If you’ve got personal, professional, and/or financial issues that are causing significant levels of stress, consider it job one to get those problems ironed out, because until you do, your training will never be optional, despite your best efforts in the gym. I’ve recently become aware of cartoonist and political commentator Scott Adams (he’s the creator of the Dilbert comic strip — the most widely syndicated comic of all time). Scott is noteworthy for two reasons: first, he looks more like me than any other human, living or dead (I recently messaged him to alert him of this fact which he found highly amusing). But more germane to our discussion here, in his recent book How To Fail At Almost Everything And Still Win Big, Adams distinguishes between goals and processes. Goals, as Adams asserts, are appropriate when you’re dealing with relatively simple, immediate outcomes: it might be your goal to win a round of golf for example. But when you’re dealing with more complex, uncertain objectives, it pays more to think about processes, which Adams defines as consistently performed habits that put you in the best possible position to come out on top. A simple example of this might be not keeping “unproductive” foods in the house when you’re trying to lose weight. Another might be committing to going to the gym every day, even if it’s only for a very short workout — even if you’re feeling unmotivated, once you’re there, good things are bound to happen. And, over time, you get used to going to the gym every day — it gradually becomes less and less of an obstacle and more and more of a mindless habit. 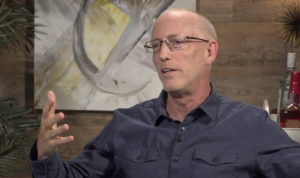 Nope, that’s not me — it’s Scott Adams! 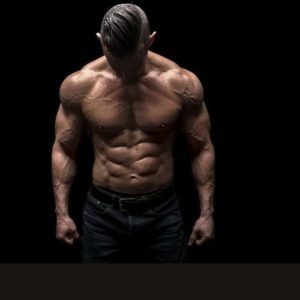 Here’s the “under the hood” rationale for focusing on processes when you’re dealing with long-term, complex outcomes: If, for example, your primary goal involves (using one of my actual goals for 2018 as an example) bench-pressing a pair of 100-pound dumbbells for 10 reps, that’s a relatively long-term and complex outcome — a lot of factors will influence (both positively and negatively) that outcome, including your willingness to train consistently, your ability to remain injury-free, and your ability to recovery from those hard, consistent workouts. Given this complexity, it’s very difficult to forecast your ultimate outcome, but it’s relatively easier to control your day-to-day habits over that timeframe. If you’ve picked powerful habits, over days weeks, and months, the likelihood of reaching your long-term goal becomes much more probable. Optimize your sleep environment (tip: earplugs), and go to bed by a specific time each night. The list of possibilities here is nearly endless, but the overall idea is to set up, initiate, and follow through on regular habits that put you in a position to succeed. They won’t guarantee success of course — they’ll just put the odds in your favor. And that’s pretty powerful. Returning to the topic of goals, give some serious thought to how achieving your projected goals will improve your life in some way, and/or, how they might advance your closer to other goals. For example, looking at my 2018 training goals (more on that in just a bit), I’m shooting for aggressive 10RM rep goals for 4 different exercises. The premise behind this is that if I can achieve these objectives, I should have gained some new muscle in the process — that should be obvious. However, in the process of achieving my 4 training goals, I’ll need to get stronger as well, and I love training for strength, so I get the opportunity to scratch that itch along the way. Note that the four exercises I’ve chosen represent every major muscle group, so I won’t become unbalanced by pursuing these goals — in other words, these goals will encourage, if not require, my training to be well-balanced, rational and safe. They’ll encourage me to get serious about my nutrition, recovery, and stress-reduction efforts. First, small goals aren’t very exciting, right? For example, many would suggest that maintaining my present abilities would be a more prudent goal for a 58-year old. However, I’m just not sure how to stay motivated if I’m simply trying to maintain. Maintenance, while it’s in fact a worthy outcome when you’re in your late 50’s, just isn’t aspirational enough to fuel my best efforts. Second, I’d rather shoot for the stars and land on the mountaintop (to quote an old saying) than shoot for the mountaintops, and land in the valley. In other words, even if I fail to reach any of these goals, if I apply myself to the achievement of them, I’ll be in a better place as a result of my efforts. As a final note before I turn this over to your questions and comments, make sure your goals are in writing, specific, measurable, and challenging, yet possible. And also, please make sure your goals excite you. After all, training is difficult enough as it is, so it’s important that you have some fun along the way. If you’ve got questions or comments about my goals or yours, please post them below! I’m always down for talking shop, so hit me up! Looking forward to following progress in 2018 as well as your new focus on more articles. Hey Shib, thanks for chiming in! Sorry to hear about your injury history, but please stay in touch and keep me up to date!